Hello pizza lovers! I love creating new and unique recipes, as evidenced my love of ingenious grilled cheese month creations. Over at Vegas.com they are getting excited for an upcoming pizza event. The International Pizza Expo is being held at the Las Vegas Convention Center in March. I love a good creative challenge, especially one involving cheese, and marrying together pizza and one of the many great Las Vegas hotels was a lot of fun. I put together this pizza recipe inspired by Caesars Palace. Caesars Palace is celebrating its 50th anniversary this year and was recently named one of the 14 Places in America You Have to Visit in 2016 by USA Today. 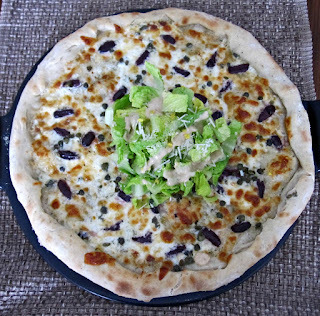 When I visited England in 2012, I was delighted to order a pizza with arugula salad in the center. I took that "lighter pizza" idea and combined the classic Caesar salad with a modern vegetarian twist. 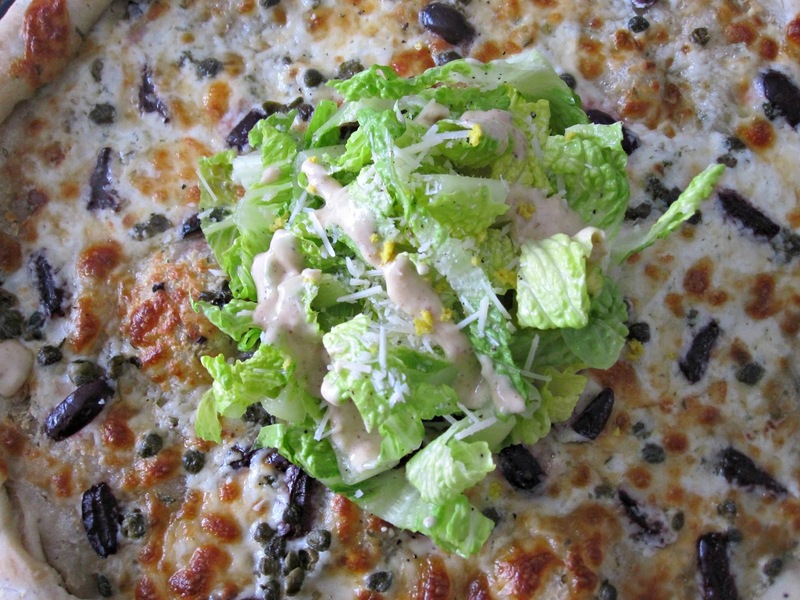 Although Caesar Salad was not invented by the Roman Emperor himself, but rather an Italian immigrant, this pizza combines classic with modern like Caesars Palace itself. 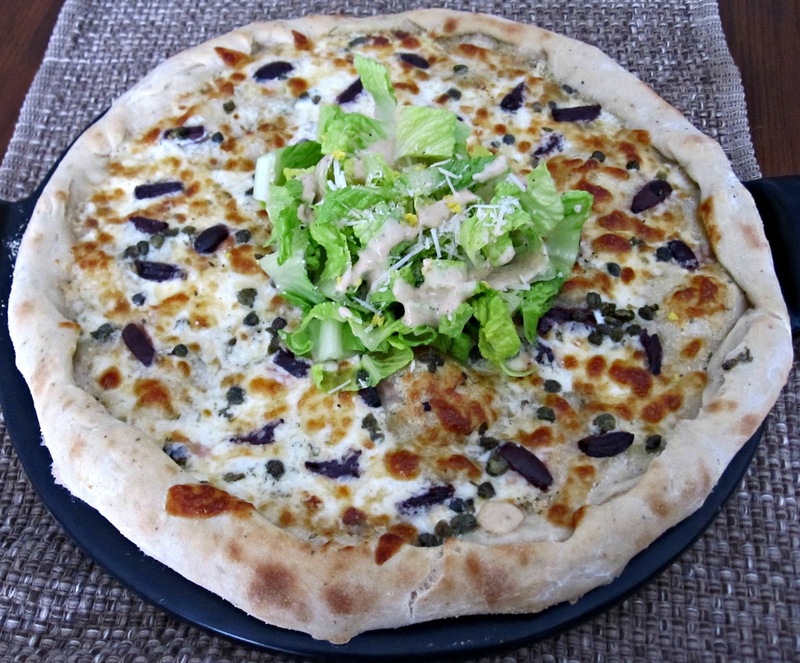 This pizza includes four components: Black Pepper Pizza Dough, Parmesan Alfredo Sauce, Caesar Salad with Vegetarian Caesar Dressing and the Pizza Toppings. A Vegetarian and Cooking original! 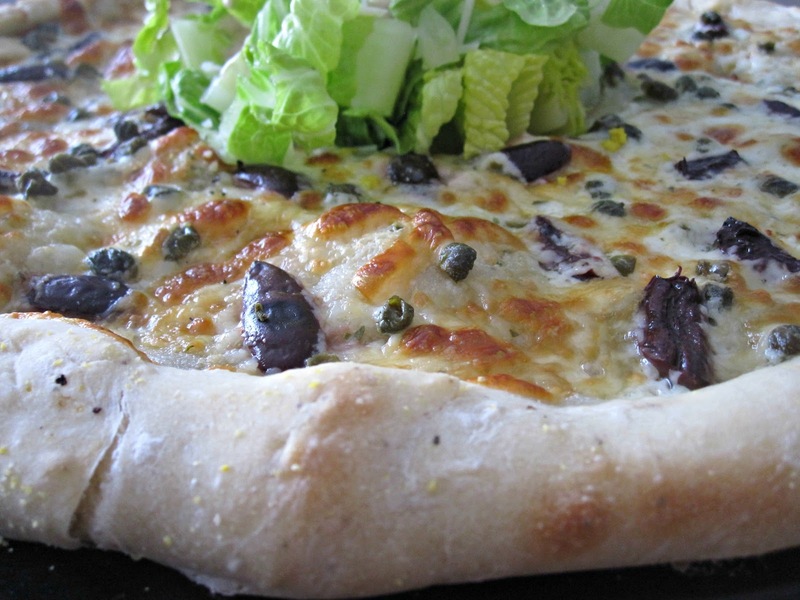 (dough slightly adapted from Emeril Lagasse and dressing adapted from Vegetarian Food Lab). The best way I've found to make sure that the water is warm enough for the yeast, but not hot enough to kill it, is to test it on the inside of your wrist like you would do with formula for a baby. Not too hot, not too cold. In a large bowl, combine the warm water, yeast, honey, and 1 tablespoon of the olive oil, stirring to combine. Let sit until the mixture is foamy, about 5 minutes. Next you'll create the dough, by adding 1 1/2 cups of the flour and the salt, mixing by hand until it is all incorporated and the mixture is smooth. Continue adding the flour, 1/4 cup at a time, working the dough after each addition, until the dough is smooth but still slightly sticky -- you might not need all of the flour, I used an additional 1 1/4 cups of flour. Turn the dough out onto a lightly floured surface and knead until the dough is smooth but still slightly tacky, 3 to 5 minutes. Coat the inside of a large mixing bowl with the remaining olive oil. Place the dough in the bowl, turning to coat with the oil. Cover with plastic wrap and set in a warm place, free from drafts, I put mine in the oven (make sure it's not turned on), until the dough has doubled in size which will take about 1 1/2 hours. When the pizza dough has doubled in size, prepare the sauce by melting the butter in a medium saucepan over medium-low heat. Once the butter has melted add cream and simmer for 5 minutes, then add garlic and cheese and whisk quickly, heating through. Stir in parsley and remove from the heat. You can use a pizza stone or pizza pan to bake this recipe (I used a pizza stone), spread a pinch of cornmeal onto the pizza stone and turn the dough out onto the pizza stone and press it out until it has formed a circle. Roll the edges to form a slight crust. Top the crust with alfredo sauce, you'll have about one cup of leftover sauce, save this for dipping the crust into or for a topping on leftover pasta later in the week. Next, sprinkle the alfredo sauce evenly with the provolone cheese, kalamata olive pieces, and capers. Bake the pizza at 450 F for 10-15 minutes or until the cheese is bubbly and the crust is golden brown. Use a small bowl to create a circular pattern in the center of your pizza, use a knife to carefully cut out this center circle. 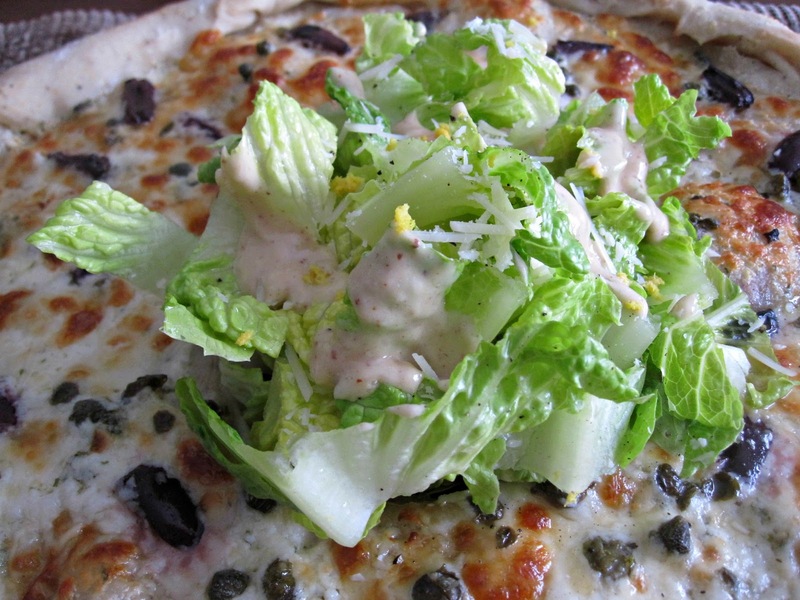 Fill the center of the pizza with the romaine lettuce and top the lettuce with the vegetarian Caesar dressing, Parmesan cheese, black pepper and lemon zest. If desired serve the extra dressing and/or alfredo sauce on the side for dipping. This was my first time making pizza dough and I was pleasantly surprised with how the crust turned out. The black pepper really helped to tie the entire recipe together. I used the capers and olives as toppings as a nod to anchovies which are used in most Caesar salad dressing, the briny quality of both helped to mimic the salty anchovies. The creamy Parmesan alfredo sauce helped to balance out those briny qualities and the crisp romaine lettuce added a nice textural difference with its fresh crunch. I enjoyed the vegetarian Caesar dressing a lot and thought it hit all of the right notes, Dave enjoyed using it as a dipping sauce for his crust. All of the pieces combined mimicked a Caesar salad, but in dare I say it, a better version that was oozing with alfredo sauce and melted provolone cheese. The dressing and the alfredo do make more than is needed for the pizza, but those are both versatile sauces that can be reused throughout the week. This pizza didn't last the evening in our house, between us enjoying it as an early dinner and Dave taking down the leftovers before the end of the evening, I declare this a hit.